The Natterjack Toad (Epidalea calamita) is a toad native to sandy and heathland areas of Northern Europe. Natterjack Toads are found in southwest and central Europe, but are rare in Britain. Natterjack Toads can, however, be found in southwest Ireland, pockets of Norfolk and Lincolnshire, and along the coast between Lancashire and Dumfries. They have also been introduced to Hampshire and Surrey. The Natterjack Toad has a body length of 6 – 8 centimetres (up to 10 centimetres in rare cases). Female Natterjack Toads are larger than male Natterjack Toads. Natterjack Toads are distinguished from the common toad by a yellow line down the middle of the back. Natterjack Toads have relatively long legs, and this gives them a distinctive gait, contrasting with the hopping movement of many other toad species. Natterjacks have a very loud and distinctive mating call, amplified by the single vocal sack found under the chin of the male animal. Male Natterjack Toads have a loud rasping call, which sounds like rrrrRup, rrrrRup. Natterjack toads have rather flattened bodies with short limbs. Their feet are not completely webbed. They have green/gold-coloured eyes with horizontal black pupils, behind which are prominent parotoid (toxin-secreting) glands. 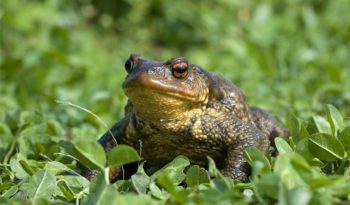 The toads dorsal surfaces are pale brown, olive or grey, with red, brown or green-coloured warts. The ventral surface is white with dark spots, and they have a yellow stripe that starts at the top of their snouts and runs down their backs. Natterjack toads also have the ability to darken or lighten the colour of their skin, in order to camouflage themselves in their environment. The Natterjack Toad is generally found in open and unshaded light sandy soils of coastal dunes, lowland heaths, semi-desert, high mountains, pine forest glades, gardens, parks, agricultural fields, sand and gravel quarries and meadows. In the daytime these animals hide in heaps of stones, in sandy soil and under debris. Natterjack toads live for up to 12 years. Adults feed on insects, particularly moths, as well as spiders, woodlice, snails and worms. The tadpoles feed on algae and vegetation until they are about 38 days old when they begin to feed on animal tissue. Natterjacks are mostly nocturnal. They move along considerable distances each night, which enables the species to colonize new habitats very quickly. The Natterjack Toad spawns between the end of April and July, laying ‘strings’ of eggs in shallow pools. They may lay 3000 – 4000 eggs, which hatch within 5 – 8 days. Natterjack toad tadpoles are the smallest of all European tadpoles. Depending on the environmental temperature, metamorphosis can take anywhere between 5 and 16 weeks. Their loud mating calls are important because the Natterjack Toad is often present in low numbers so it is important that males and females can find each other. Natterjacks tend to rest under large stones, or in crevices and burrows during the day. Their short limbs mean that they are unable to leap very far, and usually only do so as a startle response before going into their normal running gait (a bit like a lizard). They are also poor swimmers and are known to drown quickly in deep water if they cannot get ashore. Natterjacks emerge from hibernation in March (usually after common frogs and toads) and head off for breeding their sites. Like common toads, natterjacks adopt a defence posture when threatened, raising themselves up and inflating their lungs to appear larger. 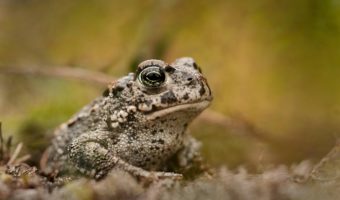 Natterjack toads are protected under the 1981 Wildlife and Countryside Act, however, their populations have been affected by the decline of their heathland habitat over the last 25 years. The IUCN Red List does not list them.